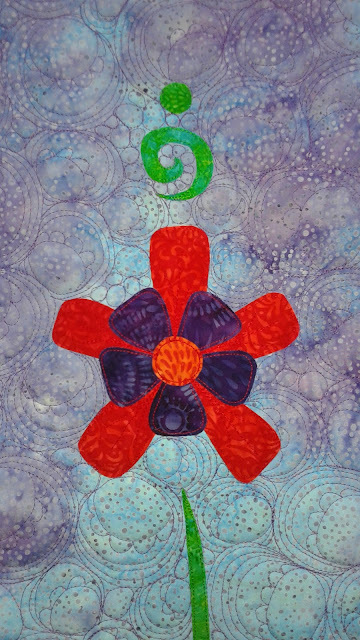 Clam Flower #12 is here! And there are two more coming this month. Then all 14 will be done. I can't wait to share. 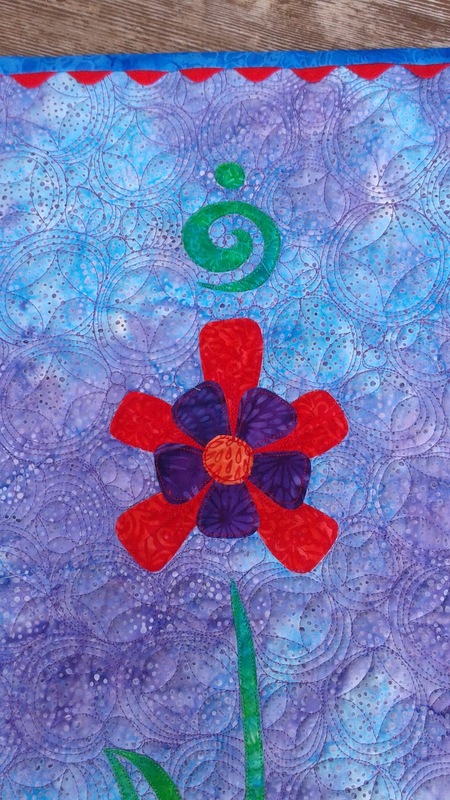 Here's the first step of this flower: I love the orange and blue combination. It really sparkles. 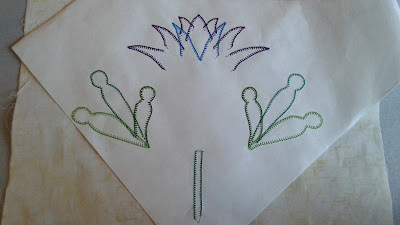 This is a closeup of the two petals so far. 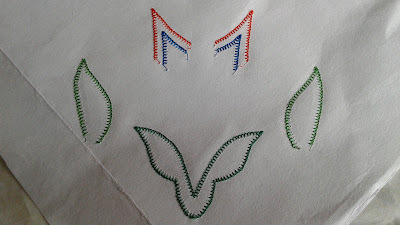 If you look closely you can see that the blue stitches are a little longer than the orange stitches. I have been doing that a lot lately and it adds some extra pizzazz. I may be the only one that notices, but it makes me happy. Today I'm going to inspire you with my latest block for the I Wish You a Merry Quilt-a-long that's going on over Facebook. 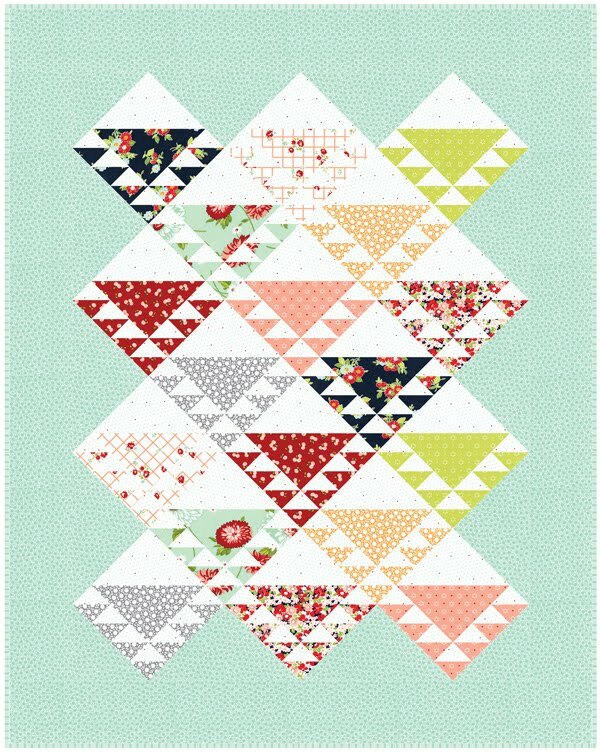 TWO new blocks come out TOMORROW and I can't wait, but for today, here's my block number two. 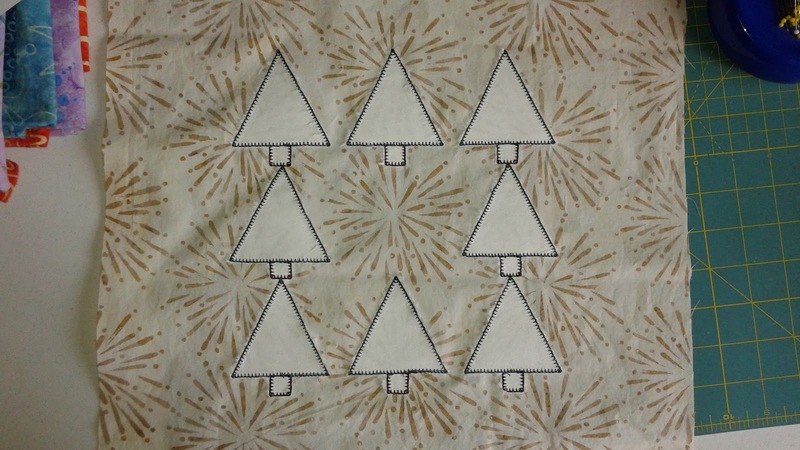 I rearranged the trees to focus on the snowflake/explosion in the background fabric. I couldn't stand the thought of cutting it up. 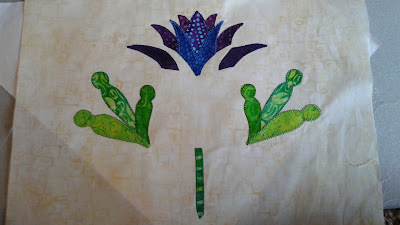 I also decided to applique instead of paper piece. Here is the block before blanket stitching. 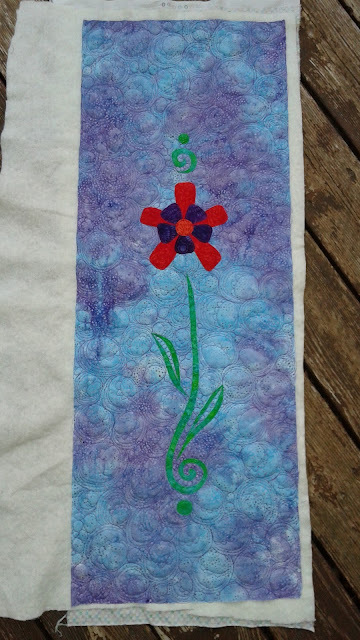 And here it is after blanket stitching. 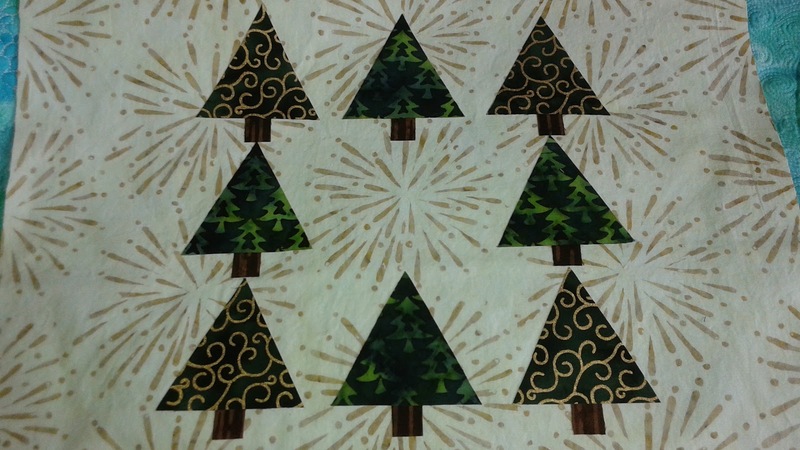 I think it helps define the trees with the gold on them. And my first two blocks together! I am loving this and can't WAIT until tomorrow! 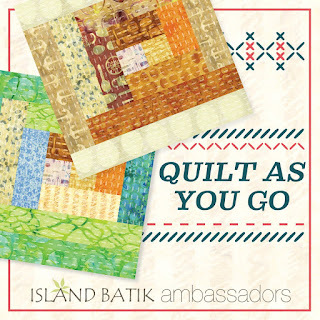 This quilt is from my most recent Island Batik Ambassador challenge. 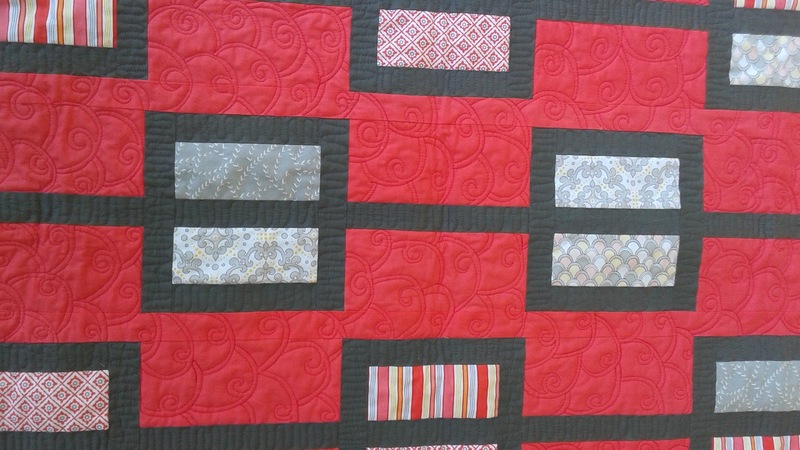 It was a Quilt as You Go Challenge. 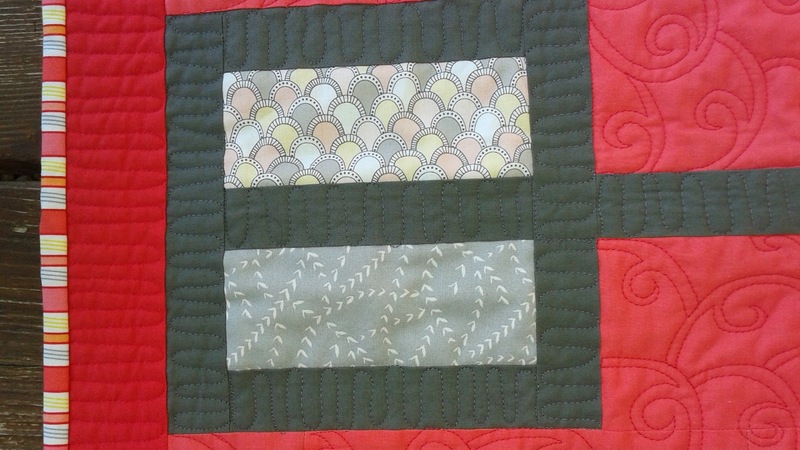 I made a quilt with three panels and quilted each panel similarly. 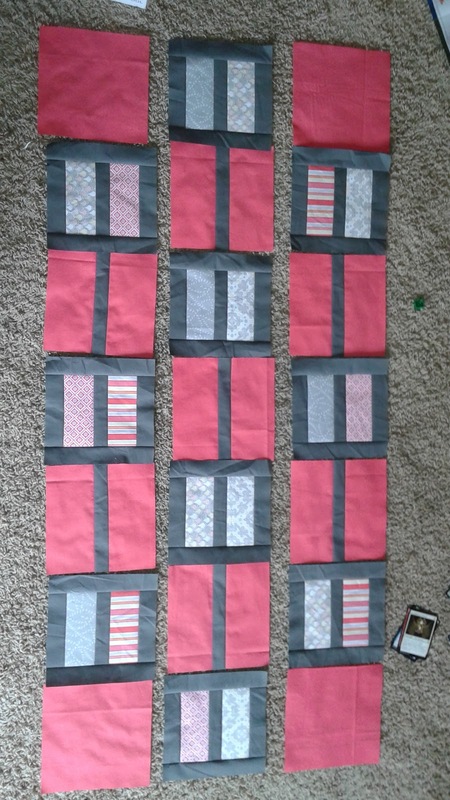 Since each panel was 36 x 12 inches I didn't want to quilt them all in the same pattern as I didn't want to get bored. 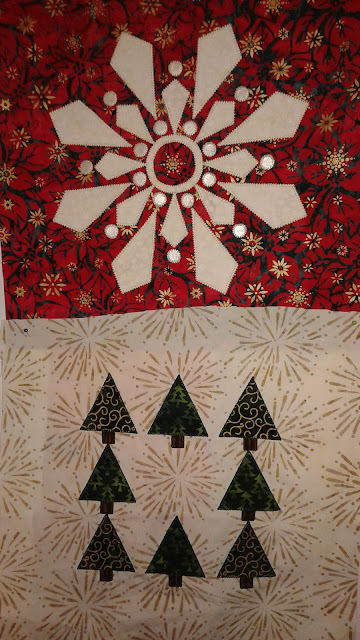 So I decided to put something inside a large circle (1-2 inches in diameter) and then echo the circles to create the similarity between panels. The first panel has a partial flower/sun inside. 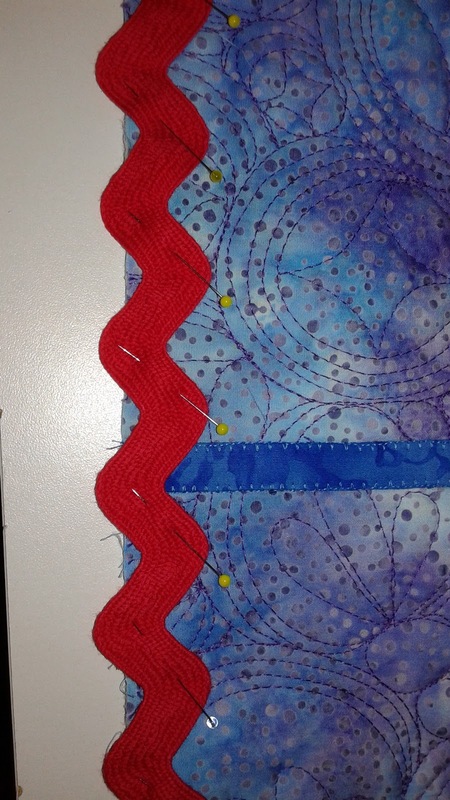 A big curve with little bumps around the outside. Here's a closer look. 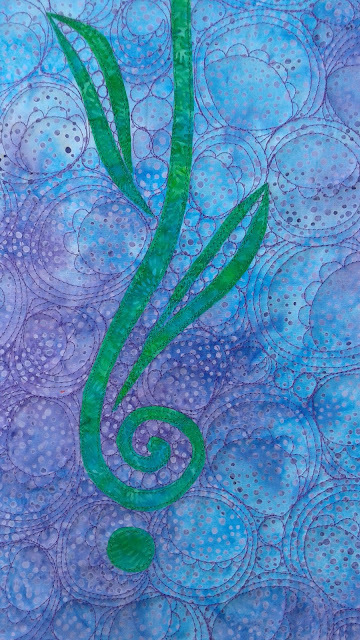 I had fun putting bubbles inside the leaves and stems and whenever I got into a space that was too small. Bubbles are always perfect for that. 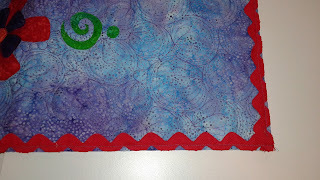 For these circles I did a pumpkin seed/orange peel inside each circle. I didn't worry about how they were oriented, they were stitched however my fabric was oriented at the time. I like this one a lot. 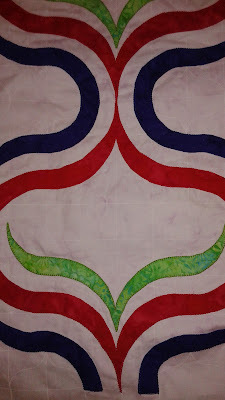 For the last design I put three feathers inside the circle. I like it, but will admit it's my least favorite of the three. 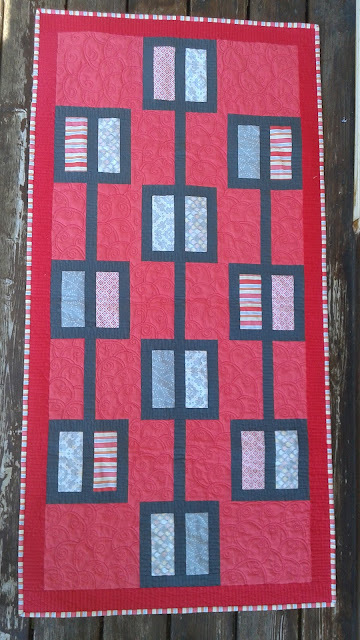 Here's the whole quilt all done. 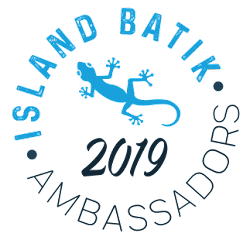 I love Island Batiks! 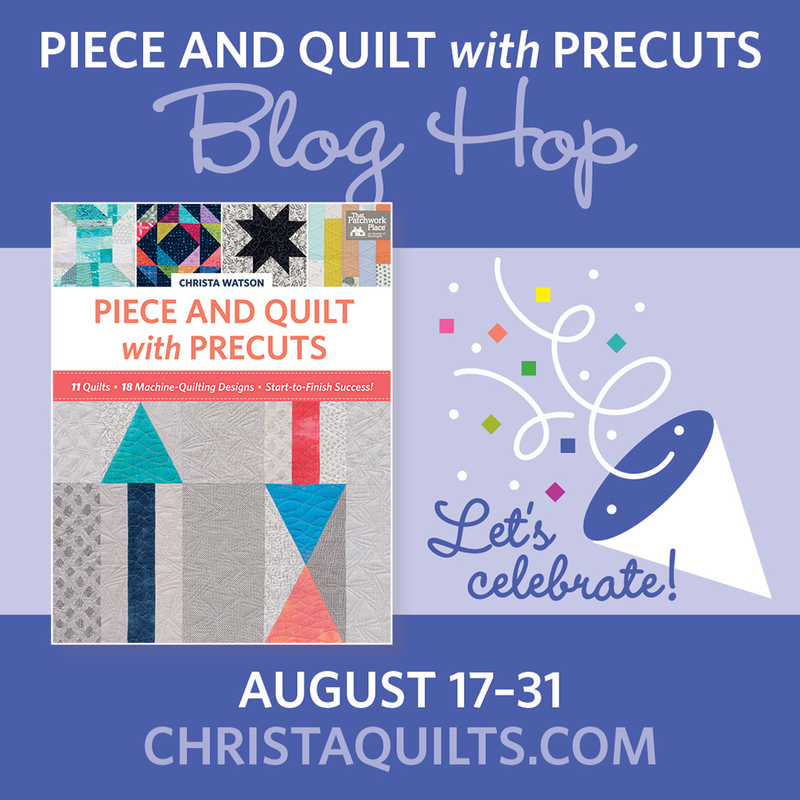 Be sure to come back tomorrow to check out the quilt I made from Christa Watson's new book Piece and Quilt with Precuts! 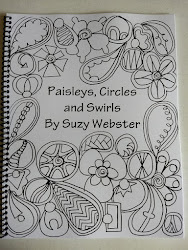 You'll even have a chance to win an ecopy of the book! 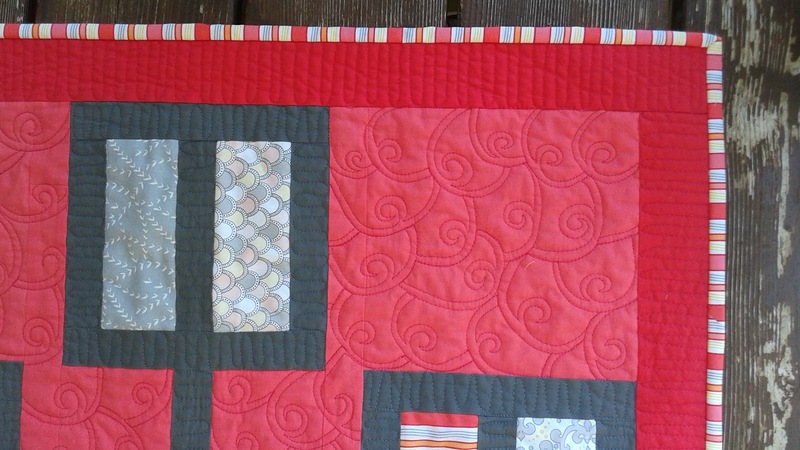 Adding wide rick rack in the binding makes a statement. It's a lot of fun to do. I started by pining on my rick rack leaving 1/4 inch between the edge of the quilt and the edge of the rick rack as shown in the photo below. 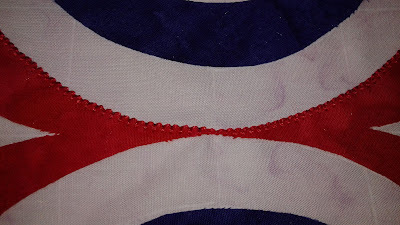 I ironed the rick rack before starting and put a pin in every bump. I used a half inch binding on this quilt (cut at 3 1/2 inches). 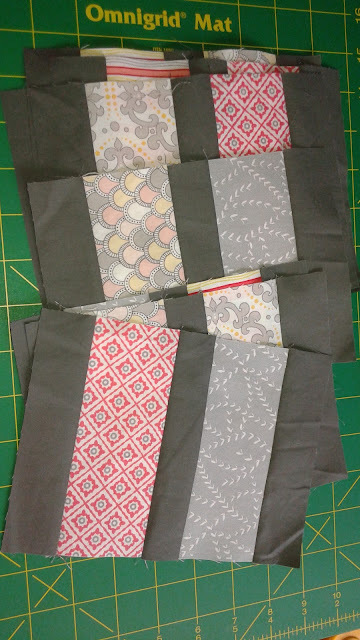 If you want to use a 1/4 inch binding with this large rick rack, I would place the bottom of the bump right against the edge of the quilt and you would have more to trim off. 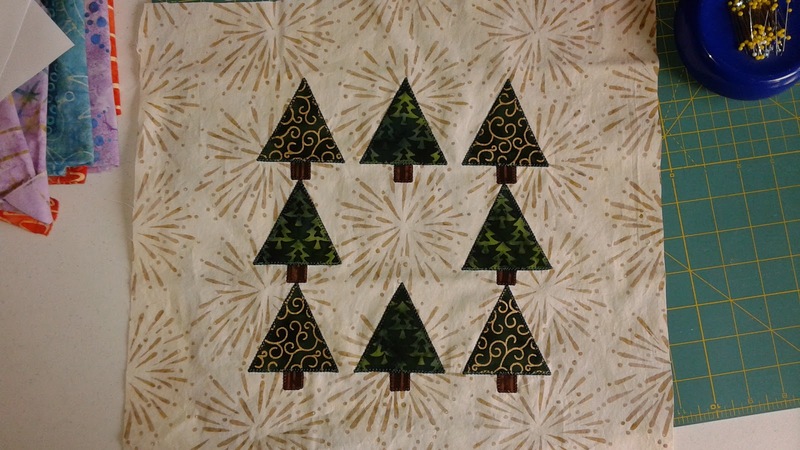 Then I trimmed off the extra rick rack by turning the quilt over to the back side. I then sewed the binding on as normal. And the final results! 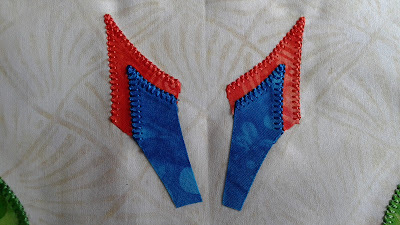 I did have two pieces that were caught in the binding and had to be ripped out and fixed. You should check before walking away from the machine (take my work for it LOL). 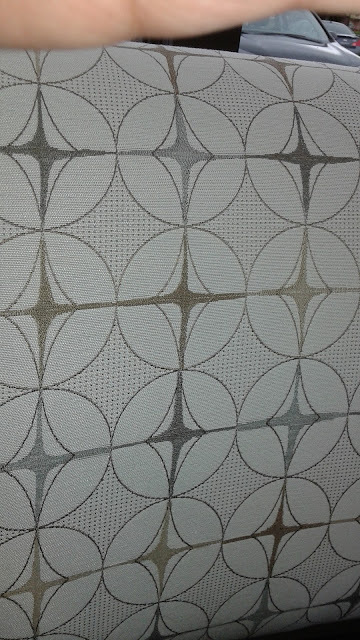 This first picture is the fabric on a chair in my dentist's office. I can totally see it as a free motion pattern or a modern quilt! 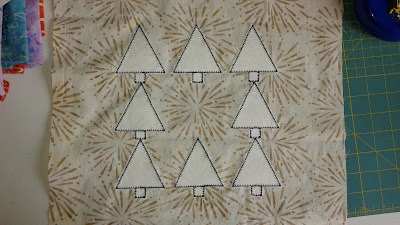 I took this one while I was doing some blanket stitching for an upcoming project. Aren't the colors lovely? 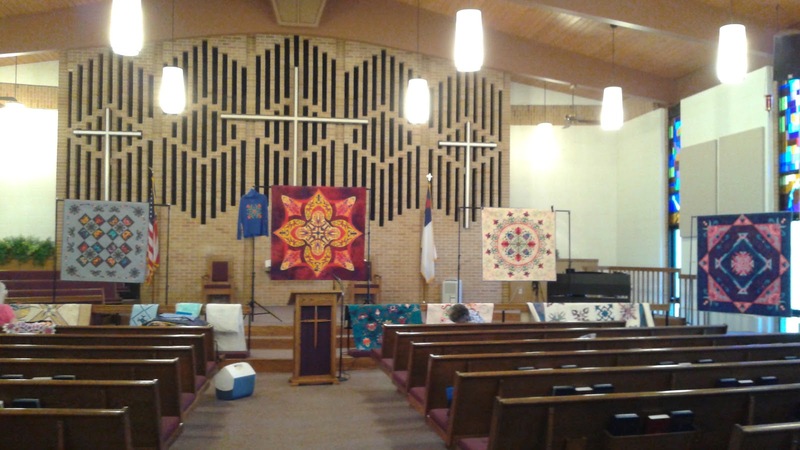 I was speaking at a church recently at this was the front of the sanctuary. Isn't the brick pattern fabulous? When I looked at this year's Island Batik Ambassador list I must admit that Quilt as You Go (QAYG) was the one I found most daunting. Why? Simply because I have never done it before. Ever. 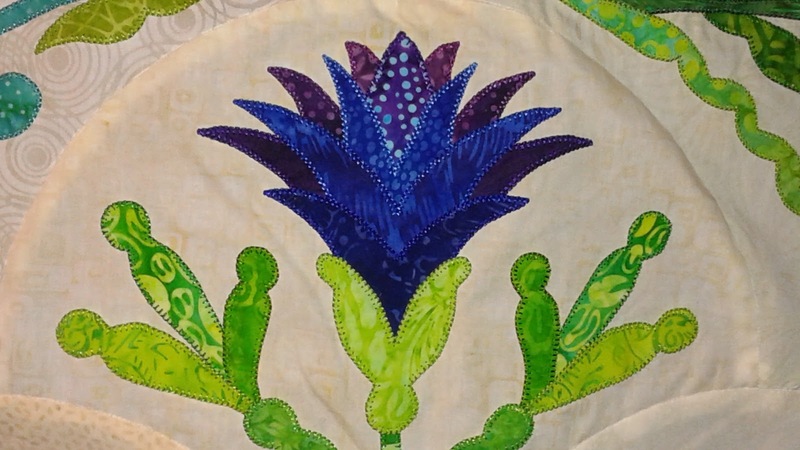 In 30 years of quilting! So what to do? 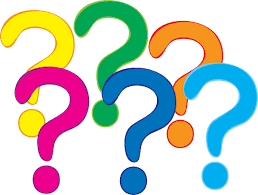 The same thing I do when a student in my third grade classroom asks a question I don't know the answer to...ask "Professor Google." I found videos from Leah Day, Missouri Star, and many others. I watched them all. I decided I liked Leah Day's approach and went with it. I also happened to be in an art gallery as I was starting to ponder this challenge and I saw a three panel painting. I knew that's what I wanted to do. 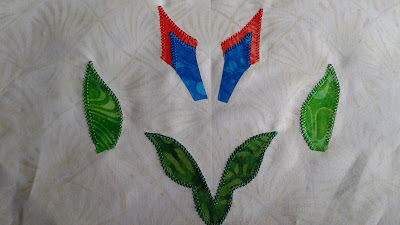 Make three panels and then stitch them together QAYG style. It turned out well and I would do it again having successfully survived the experience. 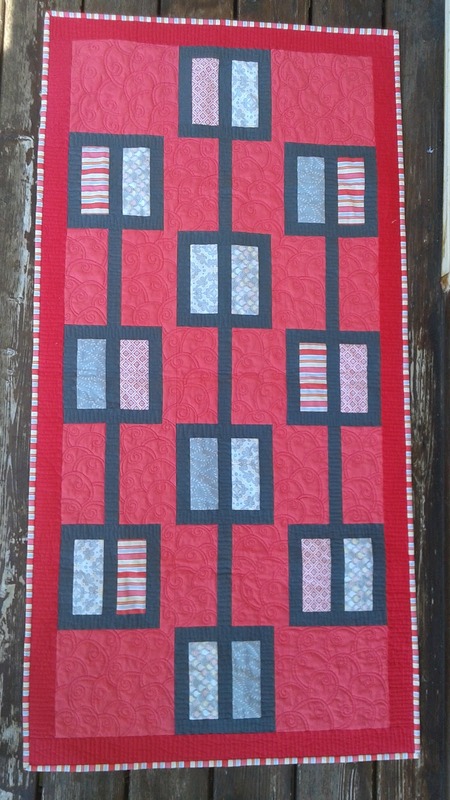 Here's one of the three panels all quilted up. In looking at it from far away now I wish the green was a little stronger, but such is life. 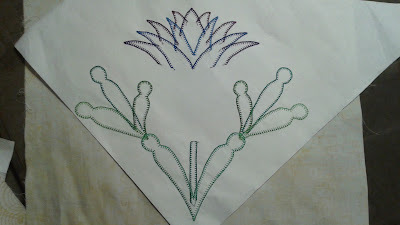 I must admit I did not make a pattern for these flowers (shocking as I usually do). I just free cut petals and leaves. The extra curl I cut out from the bottom of the stem ended up at the top of the flower and me being me, it needed a few dots. 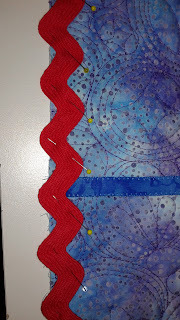 After following Leah's method I decided to do a blanket stitch on my sashing strips. 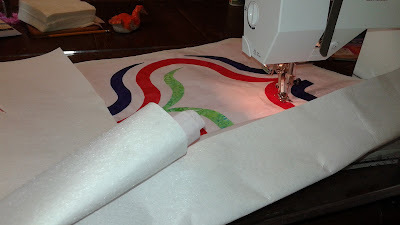 I used a different machine than I usually do for blanket stitch and found that I should go back to my usual as I'm used to how that one does blanket stitching. Next time. 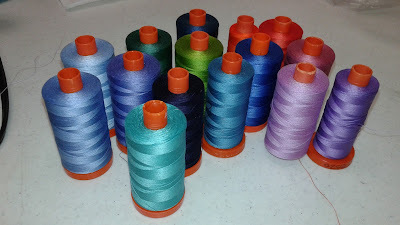 I was trying to decide what color to use for sashing. People kept telling me to use green. I decided it was too much contrast and went with a lovely blue. 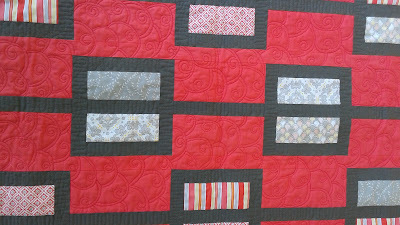 I also decided that the quilt needed more red so I added some really fat red rick rack I found at my local quilt shop. It's the perfect addition. A tutorial on how to do that will be coming next week. 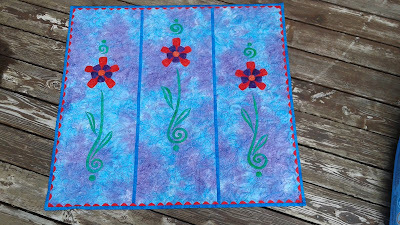 I was super excited to find out yesterday that my entry into Machine Quilting Unlimited's Inspired by MQU is one of the finalists! Machine Quilting Unlimited is definitely my favorite quilting magazine and I pondered what to do for my project for quite a while. 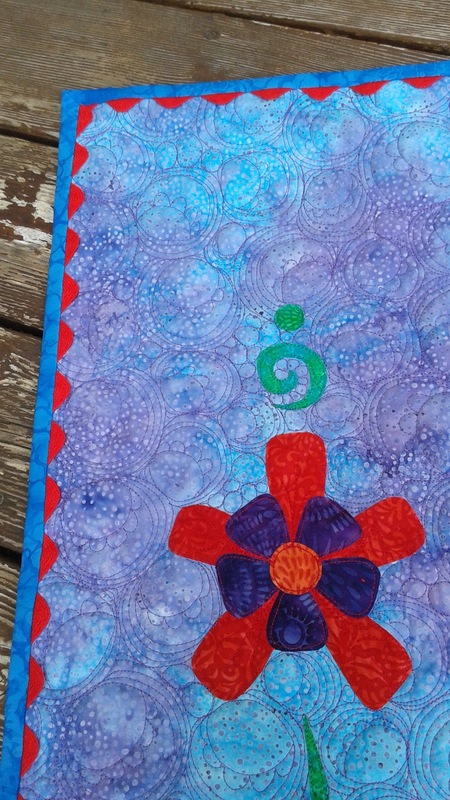 Then the last magazine came with Karen Stone's amazing OG quilt on the cover. The idea came to me instantly. I had 3 weeks to get the quilt done from start to finish. But, it was summer vacation and I had time, so why not? Sometimes deadlines are inspiring. 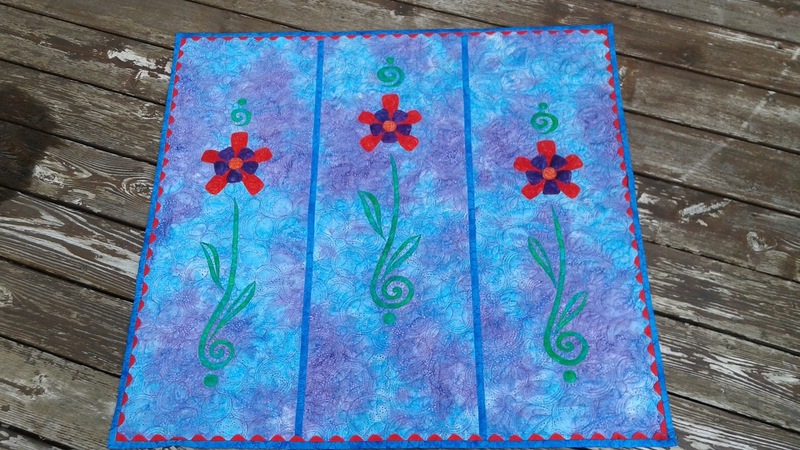 I made it with a few days to spare, but not without dilemmas. 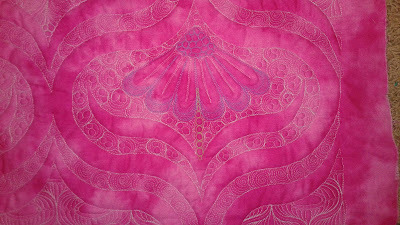 The main one being that the fabric decided to run when I blocked it. 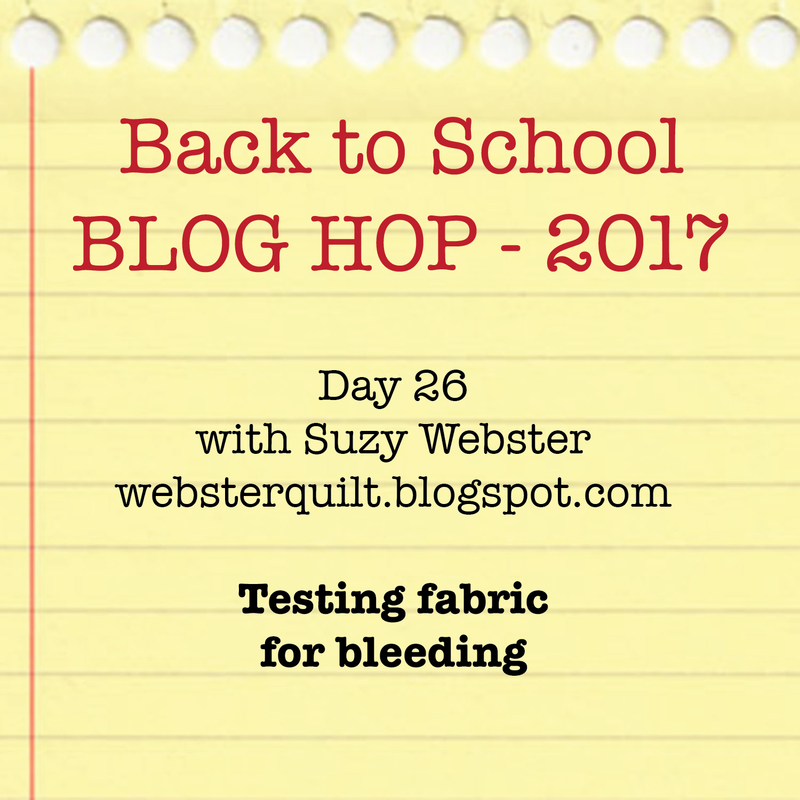 Thank goodness for Margaret Solomon Gunn's blog post about bleeding. 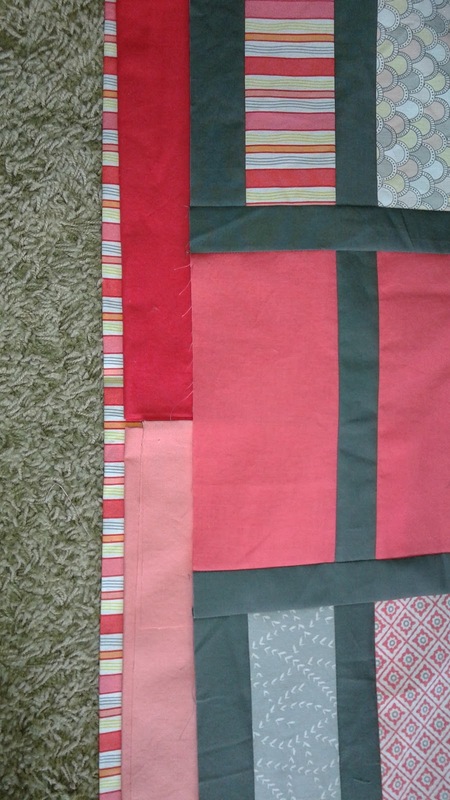 It saved the quilt! 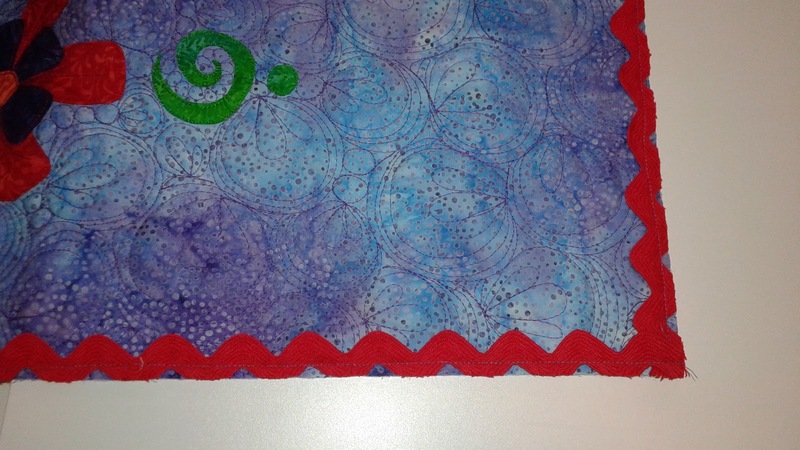 I don't want to share the whole piece until we find out the winners, but here are a few sneak peeks. You can see that I quilted it to death...as usual! 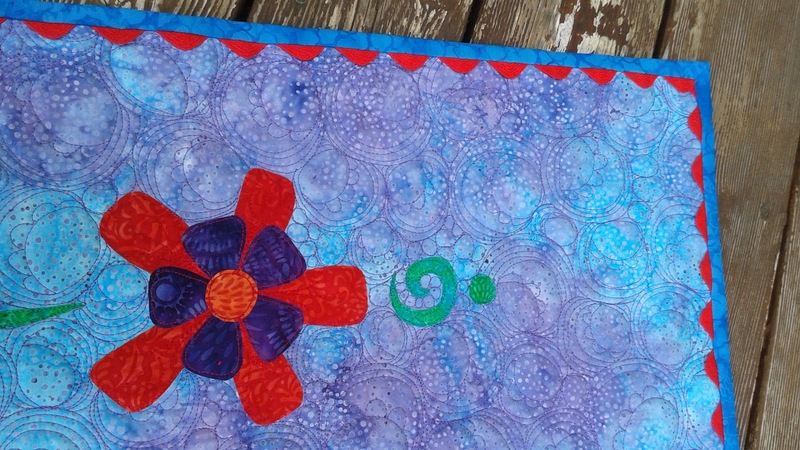 I love how this clam flower turned out. I think it's one of my favorites. 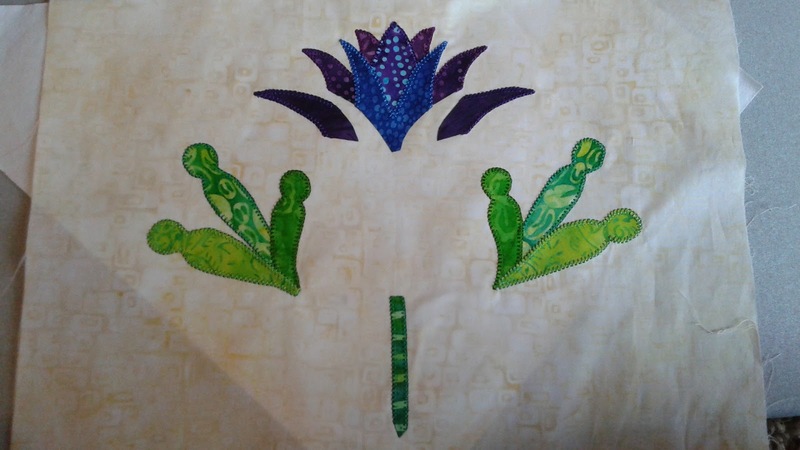 The green leaves in the picture below remind me of the toes of a frog. I just noticed that. It's going to make me laugh every time I look at this block. 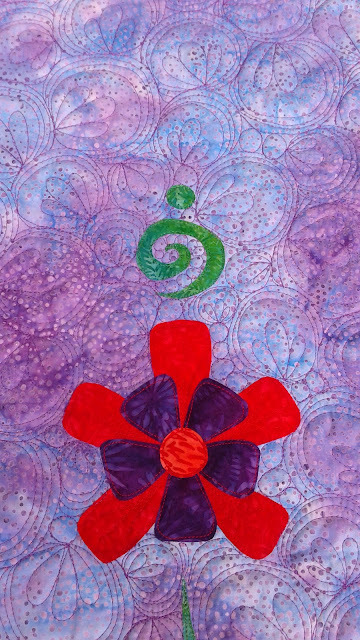 I love the way the dotted piece in the flower sparkles. 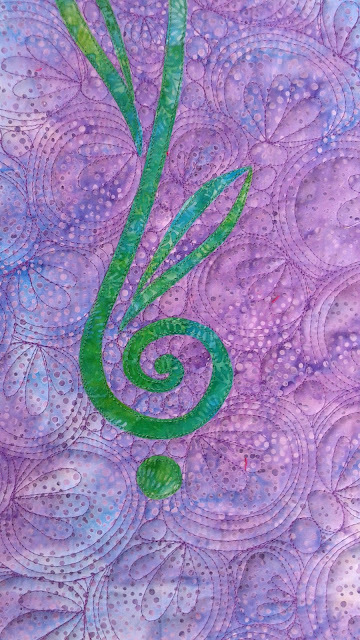 I also really like the stripes in the stem. 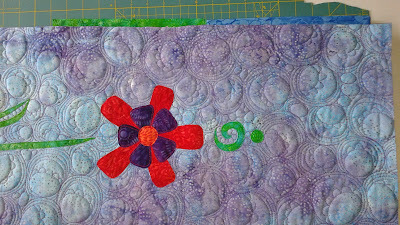 Fussy cutting fabric is such fun. 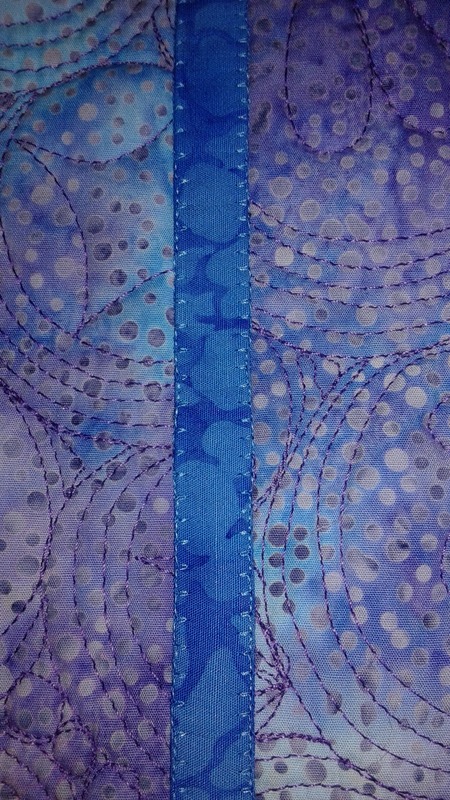 The back of layer 4. 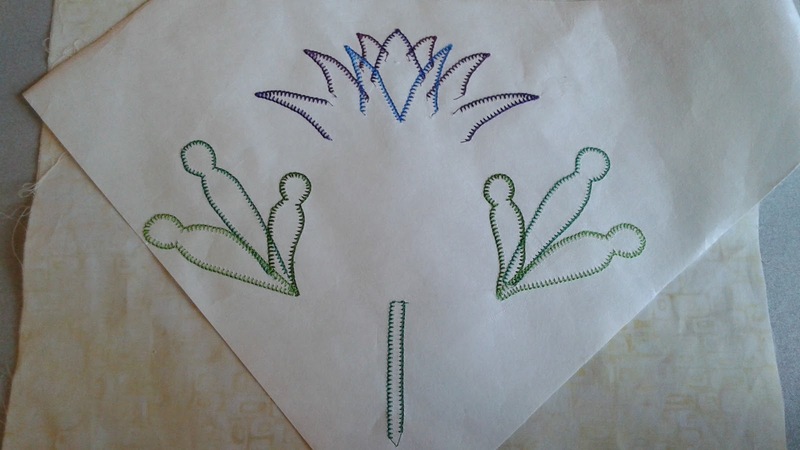 I'd forgotten to take a finished picture of this flower. Here it is all set into the quilt. Stay tuned for that! (It'll be a few weeks though). I like the contrast between the lime yellow flower stem and the dark blue flower. It's fun. 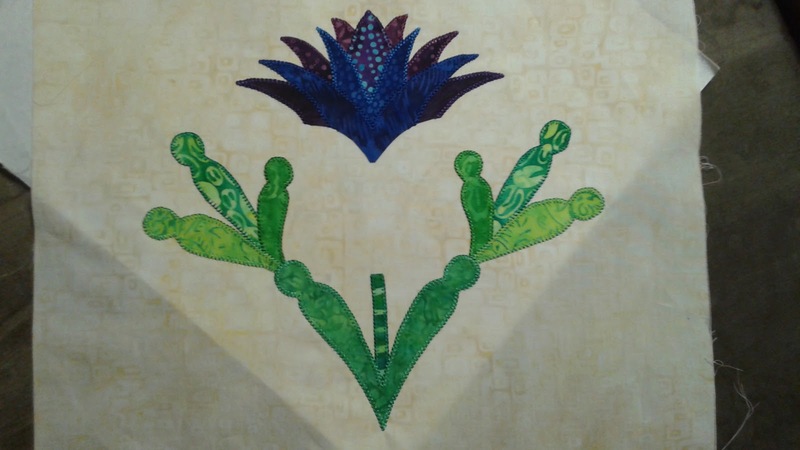 You can also see the contrast between the blue and purple flower pieces and how the dotted piece at the top ties them all together. 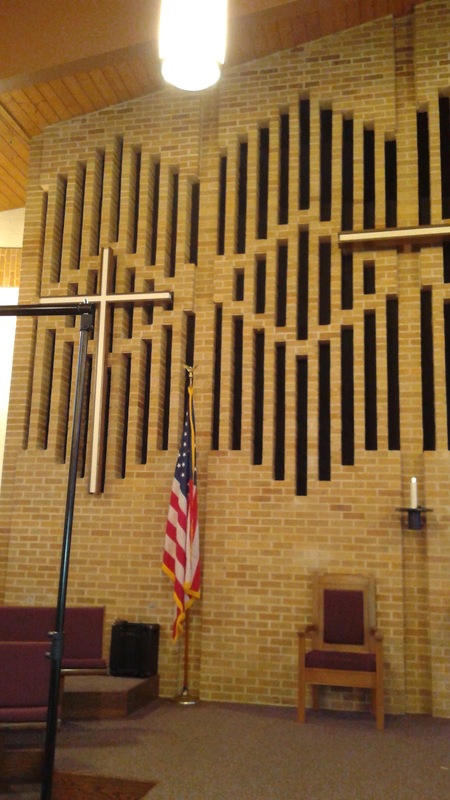 Click on the picture above to check it out! 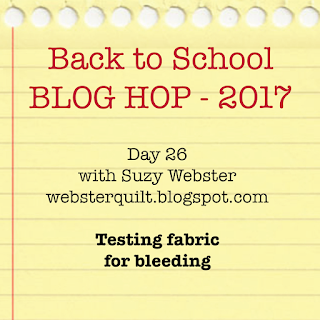 The next month is going to be FILLED with blog hops! 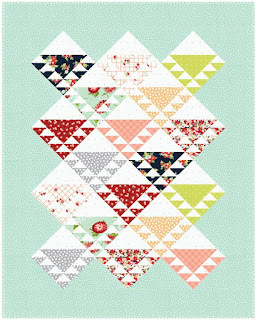 Fat Quarter Shop is doing a Lady of the Lady Quilt Along that I'm participating in this week. 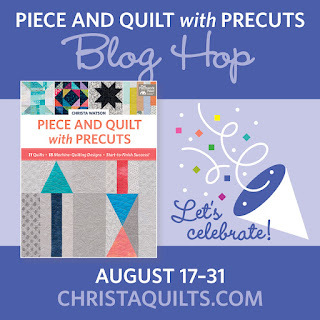 I'm part of the Piece and Quilt with Precuts Blog Hop for Christa Watson's new book which starts this week and I go next week. 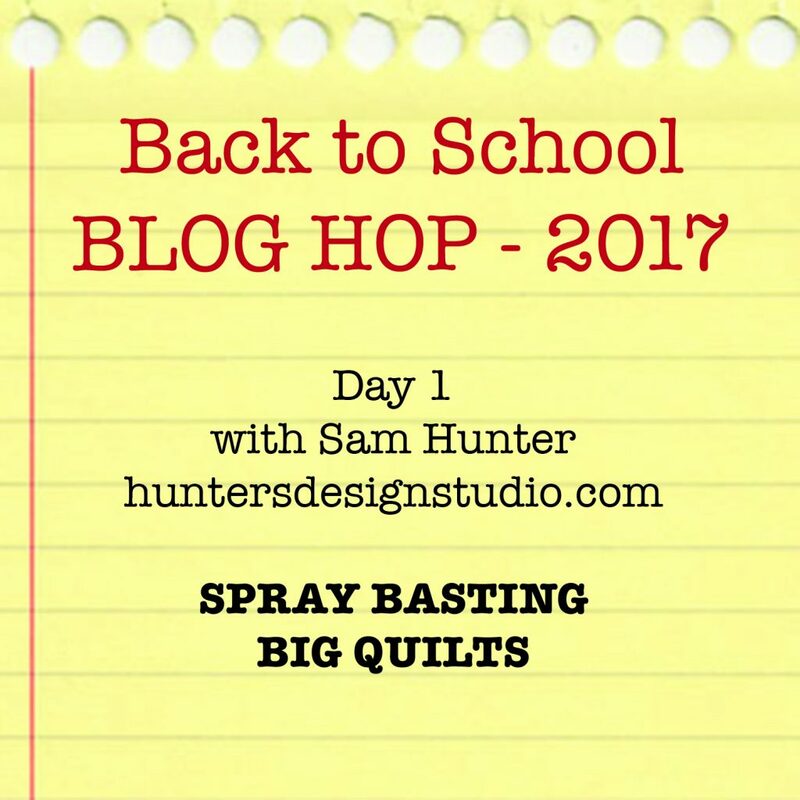 Then we have the Back to School Blog hop where 32 fabulous quilters and sewers are sharing tips each day for a month. It starts TOMORROW! Then comes the Christmas Caroling Row Along which starts September 5th and you will see my row near the end of September. 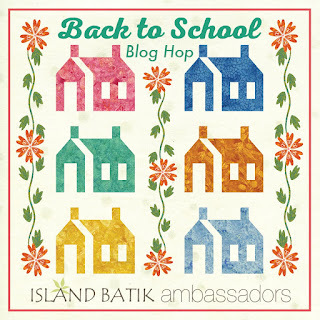 There's also the Island Batik Ambassadors Back to School Blog Hop in September as well! 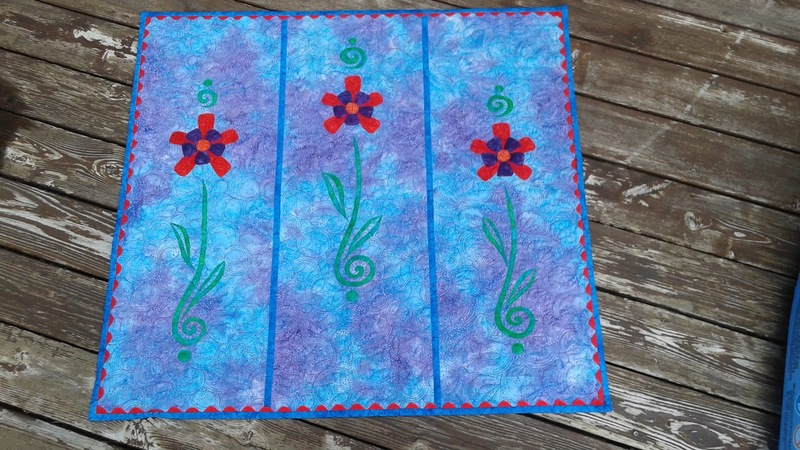 And did I mentioned I signed up to do one for Quilting with Dorie's new book too sometime in September? It's going to be a blog hop filled month with LOTS of inspiration. 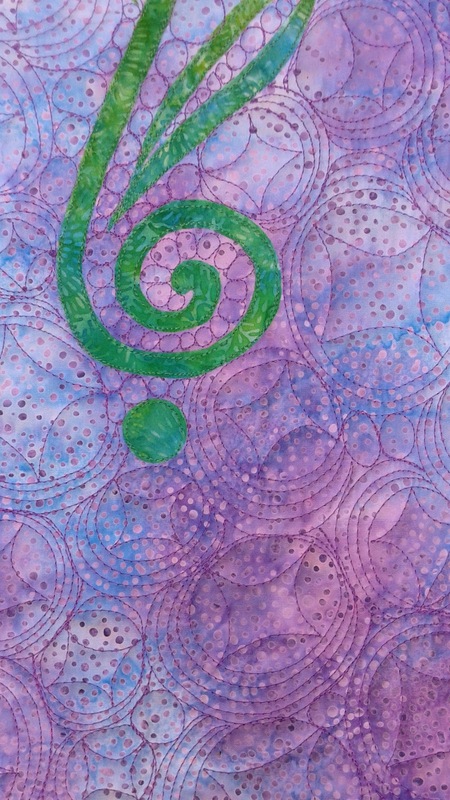 Oh, and a Halloween Blog Hop in October. 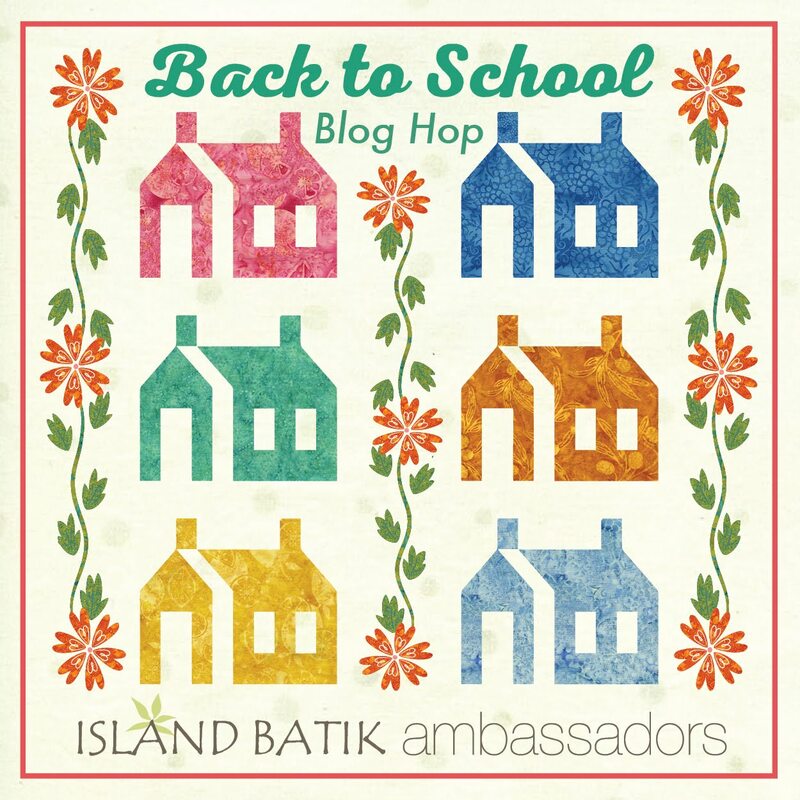 It's so much fun to be a blogger! Here's an inspirational picture for you today too. I did a trunk show last Monday at the Rochester, MN Quilter's Sew-ciety. Such fun!